Alignment Zoom is a free application that navigates you to alignments at select chainages. This program is very useful for users of Advanced Road Design. If you have an alignment of significant length, this is a very handy tool to focus on a particular chainage location along the alignment. 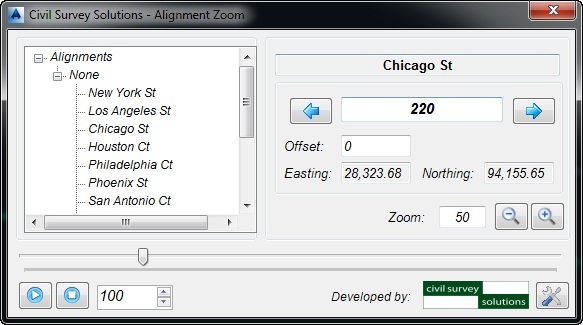 As you type in new chainage values or step chainages using the arrows, the drawing zoom updates. As you change alignments the drawing zoom updates. There is a play button to scan through the chainages at a selected speed. On Monday, we hosted a 1-hour web session on Advanced Road Design for CAD Managers. We have created a playlist of short videos for users who were unable to attend this session. The web session contained information regarding sharing data (roads & pipes) and also the use of Civil3D Data Shortcuts – we will be uploading videos on these topics shortly. This series of videos outlines the different approaches for tackling intersections using Advanced Road Design. We will also delve into the mechanics so that you understand how ARD models the intersection and how connections are established both horizontally and also vertically. Tags: Advanced Road Design, intersection, Kerb | Permalink.